Some of you are having problems with your posts not updating, so I thought I would write a tutorial on it. *Always subscribe to your feeds, so you can keep an eye on them. What is RSS: Really simple Syndication is the means of subscribing to website feeds. 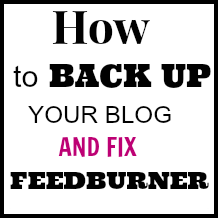 Before editing, ALWAYS back up your blog! You don't want to lose anything in case you something goes wrong, if your blog is compromised, deleted or hacked. Stay protected. Login into your Blogger account. Click the template tab. In the right hand corner, where you see the gear icon, look for the Backup/Restore button. Click it and download full template. You will see this box pop up. Now, you have your blog saved and you can always put it back. Get in the habit of doing on a regular basis. Make a folder in your documents or pictures, so you know where to find it. If there are errors, it will list them below that, highlighted in yellow. You should see your feeds dashboard. Click on your blog title. Click in the box that says Original Feed and highlight it. It should have your blog's address and show max-results=3.If it is not max-results=3, then change the number to 3. Note that max results sets the number of posts you want to appear in your FeedBurner feed. Next: Ping your blog. At the bottom of your Feeds edit details, look for Ping. and then click Ping FeedBurner. If all is well, the you won't see any errors. If there is a problem, you will see an error report. Try clearing your browser's cache and re-try. FeedBurner does have a size limit. 512k. It's rare for a feed to be larger than that, but some publishing tools generate their original source feeds with no limit. Sometimes with Blogger, the feeds are too big. Feedburner will NOT update the 'burned' version of your fees, until the original drops below the limit. If you know that your content postings are regularly very large in size, you might want to keep an eye on the original feed's size. This post was full of very helpful information, Linda...thank you so much for sharing it with us! You're so good at this "techy" stuff & I appreciate & envy your talents. Great advice. I'm glad you taught me before about saving my blog info. If you hadn't I probably never would have known to do it! I'm sure this info will help many others with this RSS feed problem. Thanks! I'm kinda computer illiterate, so this was very helpful. I've never thought to back up my blog. I wish I had seen this earlier! I spent about four hours over the weekend trying to figure out why in the heck none of my 2014 posts had been updating in feeds and email subscriptions. NIGHTMARE. I actually mentioned it in a post yesterday and Liz, one of your readers, commented and sent me your post link. It ended up being too large of a feed, so after what seemed like a zillion Google searches and tons of troubleshooting, I did end up finding out how to change my feed to a lower number, like you've mentioned. And tada, that did the trick. There's actually detailed instructions (for computer illiterates like me) under Troubleshootize on your FeedBurner account. I followed them exactly and it solved the problem. I pinned your post - hopefully anyone searching for a fix will come across it in less time than it took me! Thanks so much for all the Information ! I hope you are doing well and have a wonderful week. Linda, Thanks so much for the information. Your instructions are really good and I hope this will solve my problem, which seems to be the RSS feed is too large, among other things. Thanks so much, Linda! For the first time, I have actually backed up my blog. Prior to this, I have thought that it was backed up. It took a long time for the blog to export, but I assume that was because it's an old blog going back to 2007. And I'm happy for the organization tips because now everything is all tidy in a nifty little folder of its own. I also have it backed up to Lacie. Now the Feedburner did say congratulations, but has a lot of errors. No way that I'm touching those. I will change the number of feeds to three and perhaps that will take care of any lingering problems. Thanks again for a beautifully written tutorial that even I could understand. You're so helpful to us by sharing this tutorial. Thank you so much for all that you do. How are you feeling? You're still in my daily prayers. Loving hugs sent your way. Lindal, I need your help too. My blog has not updated since October. I go through the instructions, but no change. It does tell me my feed is too large, but I've no idea how to alter it. Thanks for these instructions. I'm printing them out. This is all Greek to me but tomorrow, hopefully I will feel better and be able to walk through this. I am sick right now and can't wait to get to the Dr. tomorrow for some REAL medicine:) Thanks so much. if your feed is a summary snippet and they have to click the link to go to read the post on your blog, will there be a difference in the feedburner original feed having a number of 3? Mine says http://www.myblog/feeds/posts/summary.